This is part 1 of a new series: Unconventional Resources for the Engaged. There are approximately 18 gazillion websites out there ready to sell you pretty stationary and silly cake toppers. The abosolute, bar-none, #1 top most important thing you could be doing right now is this: talking with your partner, and then talking with your families. I know – picking out cocktail napkins is more fun. But the talking, now, will impact the rest of your life. The napkins won’t. And the trouble is, no one teaches us how to have an honest, deep conversation. Sure, miscommunication fuels half the romantic comedies in Hollywood, but marriage is real, and hard, and it’s much much better when you’re on the same page with your sweetie, and when you’re clear and honest with your families about this new family you’re building. Wouldn’t it be wonderful if someone, say, a relationship coach or two, would sit down and explain to you how to figure out what’s important for you to say, how to talk so that you can be heard, and how to really listen? You lucky duck – they already have! In Conversations for Making Moments Matter, Judy Elkin and Pearl Mattenson lay out strategies for talking about the important moments in our lives (weddings, natch, but also graduations, funerals, even vacations!) with the people who matter most to us. Ironically, the people you’re closest to can be the hardest to talk to, and the important moments can be the hardest to talk about! That’s why you can get into a minute analysis of last night’s Mad Men with you mom, but never quite bring yourself to tell her that your vision of your wedding doesn’t match up with hers. Conversations for Making Moments Matter is like having a coach in your pocket, walking you through those conversations. Yes, they can be awkward and weird – but they can also be important and painful and awesome. This book gives you the tools to approach these conversations, and strategies for when conflict arises, so that you can feel confident treading territory that may be new for you. It’s an eb00k, so you can download it and start reading in minutes. Go, now. This is part 1 of a new series, Unconventional Resources for the Engaged. Please leave a comment with your thoughts on this resource and other resources you’d like to see. Coming up: books on money and imperfection – hot topics! I met Pearl Mattenson when we both wrote for (now defunct) Carrie + Danielle. Though we still haven’t met “in person,” we’ve been internet buddies ever since. When I saw her profiled on Fear.Less (go read it, it’s awesome) recently, I had to drop her a congratulatory note. We got to chatting and turns out we were both working on book projects. Suzyn is a talented writer with a down home sense of humor so I knew I would laugh. (I did). I also knew she was wise beyond her years and I would learn from this book. (I did). What I had not realized is that even without the years of training I have put in, she gets relationships and how to create meaning- in her bones. What I love about this book is that it gets at the core of what is important. Suzyn gets right to the point- It is not about the magazine driven mayhem that wedding planning has become. It is about you and your partner. It is about building a life and setting the tone for how that life together will begin. The book is content rich AND a workbook. And because the questions Suzyn asks are so fundamental and important- it is more than a workbook. It becomes a repository for your (you & your partner’s) most heartfelt dreams and closely held values. The beautiful cover ensures this will be a keepsake that stays with the wedding album and will be pored over for years to come. I think I’ve read this 50 times since she posted it – I’m completely blown away and so so honored! Stay tuned for my review of Pearl’s book, Conversations for Making Moments Matter. It’s fantastic. I launched my book two days ago, March 8. Over the past two days, I’ve posted here, I’ve tweeted, and most importantly I’ve emailed just about everyone I know (if you know me and you didn’t get an email, it’s because I have an old email address for you!) And, voila: I’m in the top 100 wedding planning books on Amazon.com!!! But the best part by far is all the wonderful notes I’ve been getting. I am really fortunate to know a large number of lovely people. My heart is filled with thanks today. Update: Later in the day, I hit #19! The gist: The aesthetics of your wedding should support your relationship, and not the other way around. Figure out what getting married means to you, build a ceremony around that, and then build an event around the ceremony. Simple. Intrigued? You can download a sample chapter here. Here’s the thing: There’s no such thing as a giant, anonymous “book buying public.” No “media machine.” There are only people, like you and me, talking to each other. So please, if you believe in this book and its message (or, if you just like me) talk about it. Tweet it. Post it. Email the preview chapter to all your friends. Give the book as an engagement gift. Post a review on amazon (hugely helpful). Mention it to your neighbor. I truly believe this book will help people. But before it can help people, they need to hear about it. I’m setting up a blog tour. My goal is 31 blogs for the 31 days of May. Reviews, guest posts, interviews, excerpts, contests… If you would like to be involved, please let me know. Thank you. So many people have supported and encouraged me in this project. I feel lucky to have such wonderful people in my corner. My proof copy arrived over the weekend. It’s real. It’s here. It’s a book! My hands shook as I held it. Then, as you can see, I read it cover to cover and filled it with post-it notes (pink ones, natch!) with tweaks, nits, teensy changes. It’s almost there. It’s almost ready to share with the world. So in honor of my proof, of my almost-there-ness, of my shaking hands… I’d like to share with you my favorite paragraph from the whole book. This is from the end of the chapter on clothes. Ultimately, this day is about you, not about your dress or your tie or your shoes. The clothes you wear are simply the packaging that allows you to be the very best you on this day. Think about who you are, at this moment, at your age, embarking on this great adventure. You do not have to be the best you that ever was or ever will be, simply the best you right now. How did you get to this point in your life? Where are you going from here? Obviously you’re pretty wonderful—after all, someone wants to partner with you for life! Show yourself off. Not your body or your earrings—your self. The inner light that makes you unique. Keep the outfit simple, and concentrate on being calm, centered, and present. The glow that will bathe you when you let yourself feel all the feelings of the day will be more gorgeous than any lace, crystal, satin, or hipster cummerbund. What did you wear/are you planning to wear to your wedding? Were you comfy? Did you look fabulous? Do you think it’s possible to achieve both in one outfit? Please leave a note! A few brave souls plugged in their data and… it worked! They added stripes, they added cables – one lady even told me that my formulas were helpful when she was learning to design her own sweater patterns. This made me very very happy. Here, if you’re on Ravelry, you can see everyone’s projects. Now, skip ahead to a little over a year ago, when I posted my most outrageously successful* knitting patterns. They’re not really patterns, either. Again, you use your own yarn, your own gauge, your own head size (or that of someone you love), and voila! A hat that fits. I think I improved on the T-shirt concept in that there are no formulas to fill out (hence the “no math” thing). People have done all sorts of interesting things with them – I mean check out the creativity! (again, those are Ravelry links) I get comments like “I love this pattern! 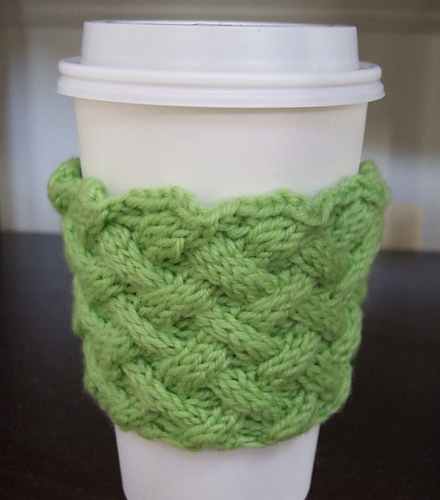 It is a little free-wheeling, but a great way to use up yarn.” This makes me very very happy. Soooo (getting to the point at last) if you’re wondering (as I do at times) how someone goes from writing about knitting and designing knitting patterns to writing a book about weddings – well, there is a through line! The book works the same way as the not-really-patterns. There’s a lot of fill-in-the-blanks, a lot of “what would YOU like?” It’s not a step-by-step guide for how to replicate something I’ve already imagined, but an invitation to put your own mark on your creation. * by “outrageously successful,” I mean triple-digit loves and double-digit projects on Ravelry! Oh, my – I’m all atwitter! Do you write a blog about weddings, or relationships, or style, or creativity, or—you know, life? Do you know someone who does? Then I want to talk to you. I’m setting up a blog tour to get the word out about my new book. I’m planning interviews, guest posts, freebie copies for contests… I can’t wait to share Going Home Married with the world! I’m suzyngonzalez@gmail.com, and I’d love to hear from you! For many years, I’ve suffered what my husband calls “the Januaries.” I might as well call them what they are: Post-Christmas let-down. See, I’m a bit of a Christmas nut, and once Christmas was over, I’d droop and mope around for a month or so, and eventually snap out of it as life went on. Christmas 2010 was particularly stressful. There had been maybe two weekends since September when everyone in my house was healthy at the same time. Christmas eve found me hiding in the corner at my sister-in-law’s, avoiding hugging anyone because I had both pinkeye and laryngitis, and madly finishing the year’s Christmas ornaments (that year it was angora snowflakes wet-blocked to round plastic needle-point thingies) for the neices and nephews, which I hadn’t finished earlier because everyone was sick. So as the 2011 Januaries loomed, my husband had a brilliant idea. “Start Christmas now,” he said. “That way you’ll be done in plenty of time and we can relax and have fun.” Immediately my mind starting whirling. If I had twelve whole months to make ornaments, I could break out the book I’d been eyeing for years: Angels: A Knitter’s Dozen . 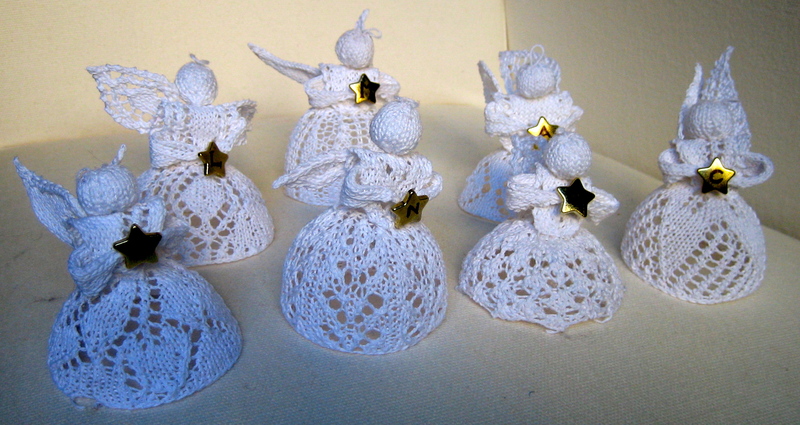 It was a whole book of tiny lace angels, knitted on size 1 dpns (aka toothpicks) with crochet cotton, and starched. They were gorgeous, but I was intimidated. However, with a year stretching out before me, I decided I could handle it. And I had a cure for the Januaries! Simple! Just keep Christmas going! Which brings us to this January, this one that started today. Christmas is over, and next year’s Christmas ornaments are done. So what do I do now? Never fear: I have a three-pronged plan of attack. Prong one: The most beautiful socks in the world. They have cables and stained-glass-window colors and they’re all mine! They’re fiddly and time consuming and I love them. Prong two: Fireside sweater. My darling, brilliant husband bought me enough Malabrigo (Emerald Blue, if you’re wondering) to make a Fireside sweater (Ravelry link). I just cast on a couple of days ago. Prong three: I’m publishing a book in the next couple of months. There, I said it. Woo! I know it’s de rigueur to talk about how excited you are about a new project, but it is true. I am truly proud of this book and excited to see it go out in the world. It’s not a knitting book – it’s a book about weddings, which I started, oh, 9 years ago. You’ll be hearing (a lot) more about it shortly. Socks, a sweater, and a book. Sounds like a cure for the Januaries to me!